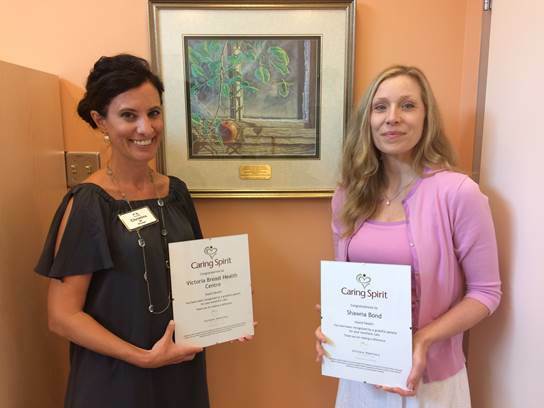 Congratulations to Shawna Bond and Dorothy Yada, Breast Cancer Navigation Nurses at Victoria General Hospital, recipients of two recent Caring Spirit awards for incredible patient care! Your wonderful care made a lasting difference to one patient who donates annually in tribute to you and has honoured you again with Caring Spirit awards and donations toward Breast Cancer Navigation. The donor’s generosity will directly help to continue and improve patient care. Thank you. Victoria General Hospital is home to the region’s Breast Health Centre, where essential screening and diagnostic procedures are performed. Breast cancer is the most common cancer among women in BC. Advanced equipment in this area improves the likelihood of early detection and more positive outcomes. Help us give patients a better chance for early detection of cancer, and a more positive outcome for patients and their families. The Victoria Hospitals Foundation would like to thank the Caring Spirit donor for these generous gifts and congratulate Shawna Bond and Dorothy Yada, Breast Cancer Navigation Nurses at Victoria General Hospital, on the well-earned distinction! Service like theirs immeasurably improves quality of life for patients on Vancouver Island.